Darlings – it’s eclipse season now, with a side serving of multiple retrogrades. Times like these, you gotta have faith. We’ve just been through the solar eclipse in Cancer. Eclipses bring with them incredible energy for beginnings and endings, which often take the form of crises. Several planets – Mars, Pluto, Neptune, and Saturn – are now retrograde, with Mercury joining the retrograde squad come 27 July. Thankfully Jupiter ended its retrograde in Scorpio on 10 July and is now happily moving forward to expand our plans + horizons, and take our lives to another level of luck + joy. The Universe is kind. There’s always a silver lining! What exactly is a retrograde, though? A retrograde happens when a planet (or, in the case of Pluto, an ex-planet) orbits along a course that looks like it’s going backwards to us here on Earth. Retrograde energies favour planning, contemplation, behind-the-scenes work, reviews, and repairs. No one’s saying you absolutely cannot start something new during a retrograde, but you’ll have to be patient and manage your expectations – delays and setbacks can occur. What if I have to do something proactive during a retrograde? Would that doom my plans to failure? Oh heavens no. Always remember that astrology is a powerful means of understanding the Universe, but it’s not the be-all and end-all of things. It could simply be in your soul contract that you are destined to do something significant during a retrograde or eclipse season, and that you’re going to learn really important things + become stronger and wiser through these experiences. One thing you’ll be strengthening for sure: your faith. We need to have faith because there’s always a waiting period between planting the seed and harvesting the crops, and no one can tell the future with 100% accuracy. So there will definitely be times when you are waiting for your expected outcomes to arrive, empty-handed, having done all you can to make things happen. What’s important is that you do what’s right, do what you can, and when you’ve done all there is to do, you stand firm in faith. Trust that Spirit has your back and the Universe has great plans for you. What is meant for you will find its way to you. Hang in there. Everything’s going to be okay. Notice it’s mostly Swords this week, and all the figures in the cards are portrayed in pretty uncomfortable (almost death-like) positions. In the Tarot, the suit of Swords represents logical thinking, communication, and conflict. Visually, this Tarot reading sounds a warning against over-thinking. Some of you might be in situations where you’ve driven yourself bonkers trying to fix something via logical means. But now it’s time for faith. LEFT: FOUR OF SWORDS. The Tarot reading starts with a call for a time-out! You need a break, stat. No point kicking against the goads – take a step back and ponder what other options you’ve got. It’s okay to distract yourself with something else (or simply lie down) while you’re contemplating your options. At the very least, a change of scenery might do you good. 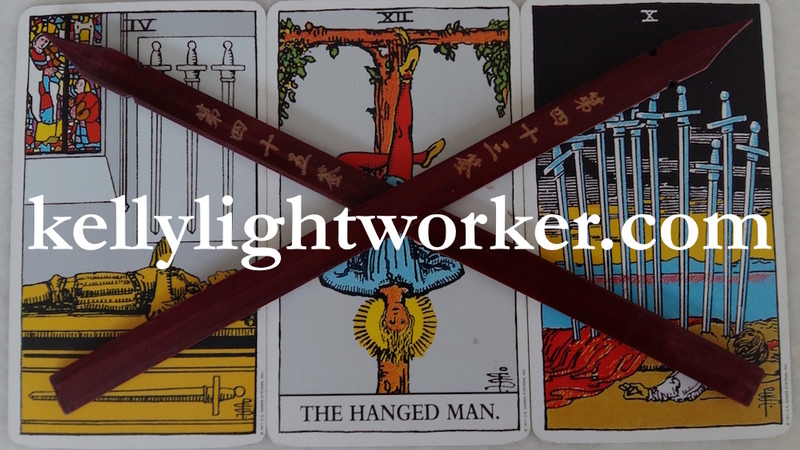 MIDDLE: THE HANGED MAN. This card calls for a creative shift in perspective, another approach to tackle the problem you’re facing at the moment. It’s also a reminder that we don’t need to control everything in order to get what we want, so now is a good time to release all false notions of control. RIGHT: TEN OF SWORDS. Some of you reading this might be mentally exhausted at the moment, or feeling defeated by an insurmountable obstacle. Hang in there – the worst is over. Do what’s right and keep the faith – you will rise again. The Goddess has given us not one, but TWO divination lots for this week! Heaven and Earth are working in harmony for the highest good. Every blessing is coming upon us. Life is filled with beauty and colour. The meek will triumph over the strong. Kindness opens the doors to great blessing. Both divination lots answer the question as to why we need faith. Lot 43 reminds us that Spirit is working behind the scenes to bring about our highest and greatest good. What’s important is for us to recognise this truth, and to go with the flow of the Universe in the sacred act of co-creation: knowing how and when to proceed, to retreat, to initiate, or to yield. And never giving up! You’ll notice that both Lots 43 and 45 are conditional: Lot 43 reminds us to maintain an attitude of gratitude in order to receive blessing, and Lot 45 describes how kindness and a meek spirit leads to favour from the Universe. Following the advice given by both divination lots requires an act of faith on our part: that what we do is seen, assessed, and will be repaid us in due (karmic) course. We may not see the outcomes of our choices and efforts for a long time. But we keep going – knowing in faith that one day, we will rejoice that we have done the right thing.